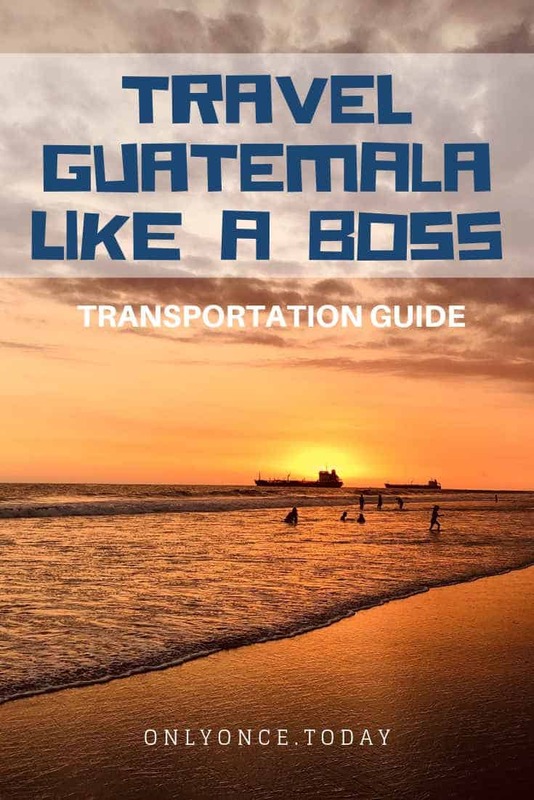 Guatemala Transportation Guide - Cover ground like a pro! When you’re going on a backpacking adventure through Guatemala and Central America, you might be researching ways to travel around. 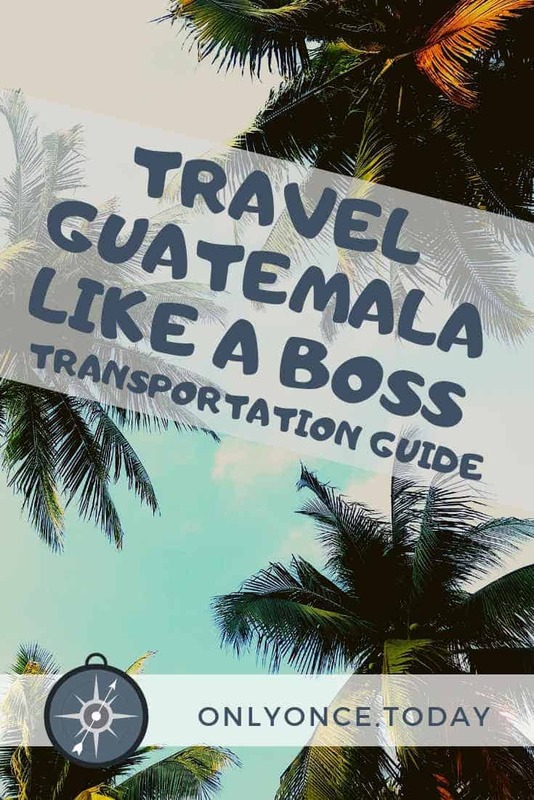 That’s exactly why we created this extensive Guatemala Transportation Guide! Most of the transportation is rather undocumented and you find ways to get around as you go. This might seem uncomfortable but it really isn’t. It’s a part of the backpacker experience. Luckily, you have quite a few options when it comes to transportation in Guatemala. These options range from traveling like a local, which can be dirt cheap. But you can also travel on tourist buses and pay a lot more. Even though there is a lack of documentation and online options for pre-booking buses, everything is taken care of and things always work out the way they should. In this guide, we talk about all the different transportation options, how to get them, and how expensive they are. You might be wondering where your luggage goes in all these different buses and rides? We answer that too! Chicken buses are the most interesting method of transportation in Guatemala and you should use a chicken bus at least once when traveling through it. The chicken buses are the old US school buses that Guatemalan drivers drive all the way south to Guatemala to paint them in beautiful and shiny colors before using them to transport people in their country. It is a lovely way to get around and you’re very likely to encounter strange scenarios and meet local people. Chicken buses are best for shorter distances because they’re not always very comfortable, but you can use them for long distances as well if you don’t mind being uncomfortable for a long time! When traveling from town to town, chicken buses can be found in the bus terminal. Remember that a bus terminal doesn’t always look like you expect them to look. A bus terminal is mostly an open and dusty lot where all the buses gather. These places usually have loads of tiny shops where you can get snacks or drinks. In larger towns, bus terminals can be more elaborate and they could be on a paved lot or even have ticket counters. When traveling from rural areas, chicken buses need to be caught on the road. You just stand at the side of the road and haul the buses down when they’re passing by. They don’t really work with designated bus stops. Guatemalan chicken buses cover rather large distances and you can cross the entire country with chicken buses. You will have to change buses a few times along the way though. These buses mostly ride between cities or towns. Chicken buses are the cheapest buses you can get in Guatemala. Depending on how busy the route is, backpacks and other luggage usually go on the roof of the bus. Even though you think they will come down when the road gets rough, they almost never do. If it starts raining, the bus will stop and they will cover the stuff that’s on the roof. Sometimes, if you’re lucky, backpacks will be stacked at the back of the bus… Sometimes, … usually not. Pullman buses are the most commonly used long-distance buses in Guatemala. They’re pretty comfortable and convenient and luckily, they’re not too expensive. Unfortunately, they don’t really cover rural areas and smaller towns. The usually stick to the cities and the international routes. Pullman buses only pick up passengers in the bus terminal. They don’t stop along the way to pick up random passengers. These buses mostly cover large distances between towns and cities. 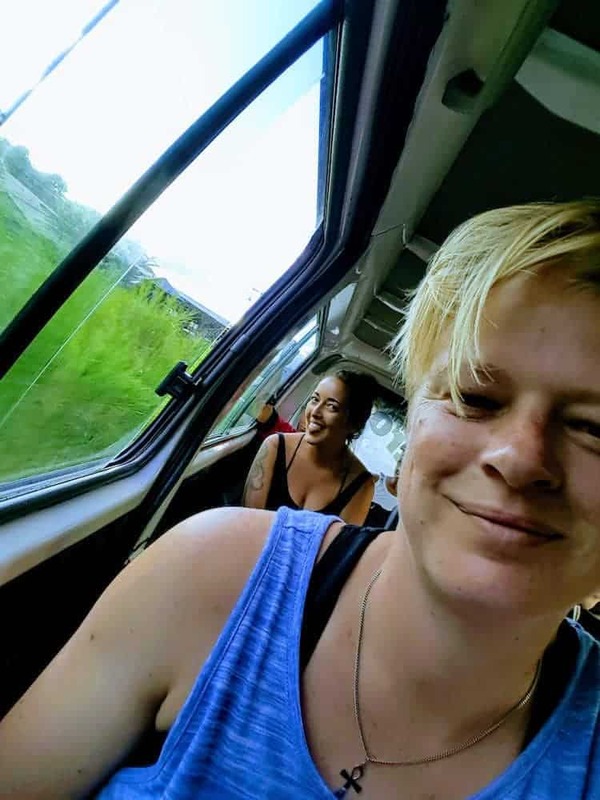 Most backpackers catch a Pullman bus when they travel on to the next country. These buses transport travelers to neighboring countries like El Salvador, Nicaragua, and Honduras as well. This option is, budget-wise, in between chicken buses and shuttles and they’re particularly good for traveling longer distances. In a long-distance bus, your luggage goes underneath the bus in a luggage compartment. 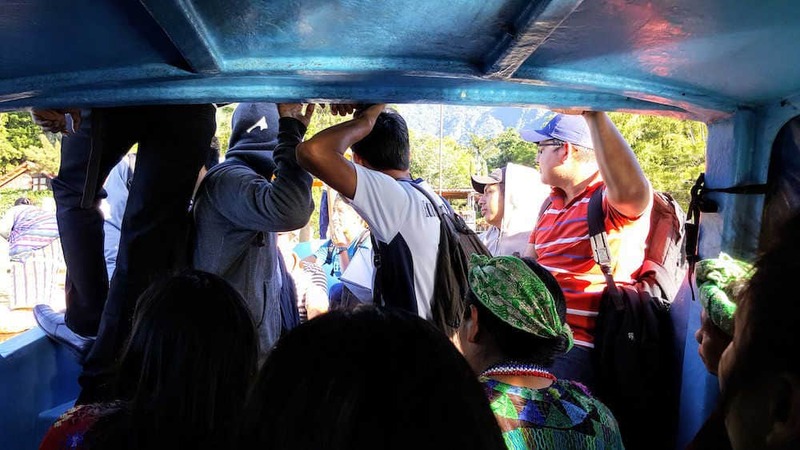 Shuttles in Guatemala have only one purpose: driving around tourists. 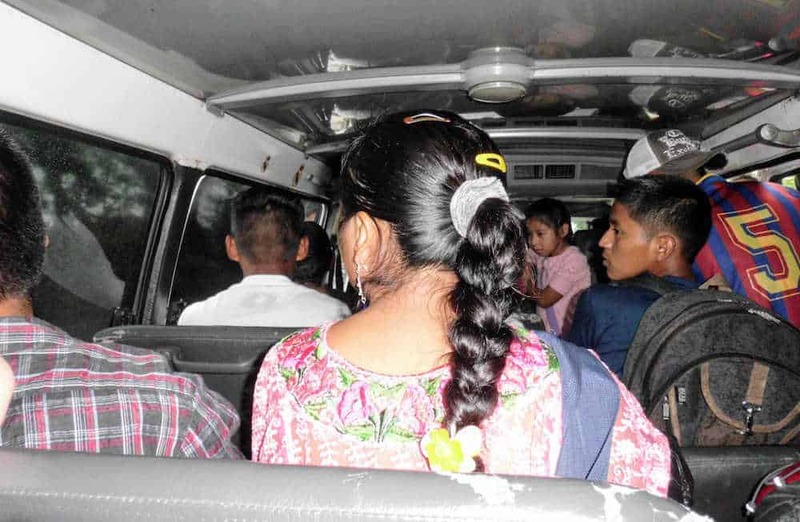 Minibusses are big business in Guatemala and they are an effective and safe method of transportation. A lot of tourists use these services because they’re good. 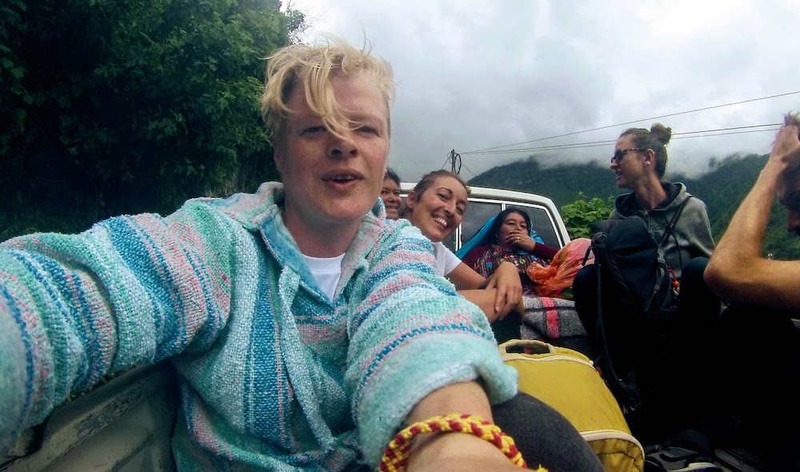 You can usually set up transportation in your hostel and have a minibus picking you up any day of the week to travel to anywhere in Guatemala. So for convenient travel where everything is taken care of: choose a shuttle, but be prepared to pay a little extra. 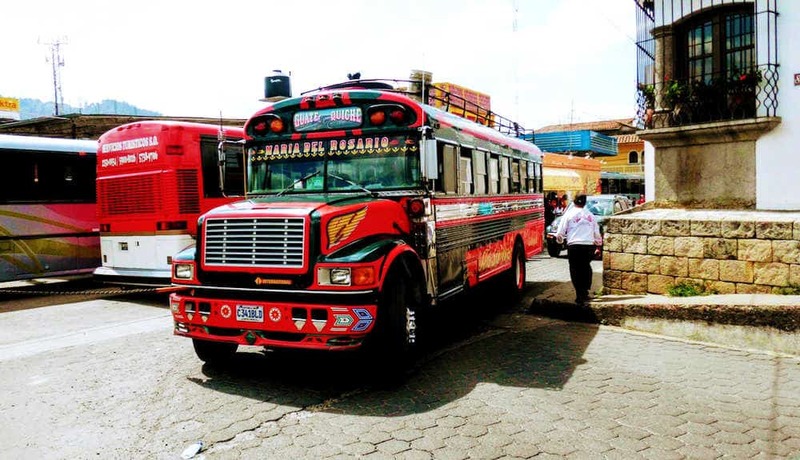 With these buses, you won’t meet any locals or get a feeling of local culture. And they’re also not completely hassle-free (keep reading to find out why). You’ll be surrounded by English speaking tourists and you’ll probably get to your destination more or less at the predicted time. Shuttles don’t pick up passengers at the side of the road. They drive a designated route and they also have a list with the names of their passengers and the hostels where they need to be picked up. If you need to take care of transportation from one place to the next, ask at your hostel. They have loads of contacts for doing so. They will make a phone call and book a spot for you. 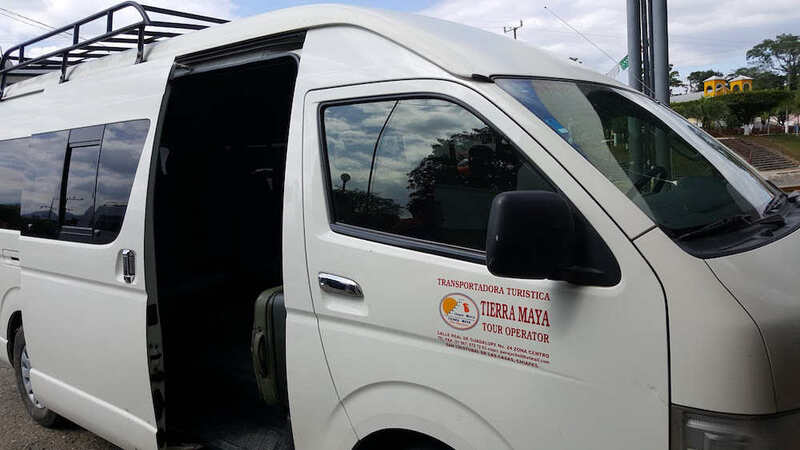 Mexican Shuttle – Guatemala shuttles look exactly the same! Shuttles cover all kinds of distances. Usually, they’re used for transportation between cities. They do have a funny way of operating and I have wondered many times why the drivers make stuff so complicated. The system does work very well and there is probably a good reason why they do it the way they do. Complicated? Let me explain that! Say you want to take a shuttle from Antigua city to Lake Atitlan. That’s a simple drive and dozens of travelers travel this route every day. A minibus will pick you up at your hostel in Antigua, along with a bunch of other travelers. The driver will take you to the edge of town, where you have to wait for half an hour until another minivan shows up, also full of travelers. There will be an exchange of travelers and you might need to switch buses already. Say goodbye to the good spot on the first bus you were so happy with! This new bus will drive you for an hour or maybe two and then it will stop for a switch once again. Luckily the other minibus was there before you, so you think this will be a smooth switch… probably not. Travelers are exchanged again and backpacks are flying from one bus to the other. You just hope your luggage made it onto the right bus! This switching of passengers can happen many times in one trip. No worries, it’s normal. Shuttles can be remarkably expensive in comparison to the other transportation options. And I must say: these shuttles are not always more comfortable. In my opinion, they put too many people in 1 shuttle too often. So you will be packed like sardines in a can. Then you have to switch buses many times, so that’s not convenient either. Shuttles are very safe and most tourists choose this method of transportation. Eventually, you will arrive at your destination without having to learn the language and without having to search for a bus. So it is convenient in a lot of ways, just don’t expect to have more leg room or an entire row of seats for yourself. With shuttles, luggage usually goes on the roof. They do secure the luggage and it won’t fall off during the ride. Luggage gets covered when it’s raining too! Lobke’s backpack did make a nasty fall during the shuttle switch. The threw it from one roof to the next and it bounced off like a ping pong ball. That was also the very last time she put her laptop in her backpack! In some rare cases, luggage goes inside the bus with you. But that doesn’t happen a lot. Collectivo’s look a lot like shuttles, but they’re completely different actually. While shuttles are for tourists and they are usually booked by tourist agencies or hostels, collectivo’s work in a more spontaneous way. All over Guatemala, collectivo’s drive a set journey. For instance, a collectivo drives from the Northern suburbs of Quetzaltenango to the Southern suburbs of Quetzaltenango via the set route. On their journey, they pick up passengers anywhere along the way. Passengers are waiting at the side of the road and they haul the collectivo’s down when they drive by. A collectivo driver team usually consists of 2 people. One is the driver, while the other one is collecting passengers. The helper is usually shouting the destination of the collectivo during the entire trip. He also helps passengers get on and off. This method of transportation is used mostly by locals, but we have used them too. The other passengers have always been charming and supportive. They helped us find the right place to get off. The price for catching a collectivo is fixed for the specific route. You can see routes of collectivo’s when there are bunches of people waiting by the side of the road. When a collectivo appears, you can just raise your hand and stop the minibus to pick you up. If you want to get off, you just yell ‘Stop!’ or ‘Baja!’, or something else you hear other people shout! For instance, we caught a few collectivo’s in Quetzaltenango in order to move through the city. But we also got a collectivo ride to get us from Flores to Poptun, which are 2 towns that are further apart. Another example is the trip from Rio Dulce town to the hot-springs of Finca Paraiso. This journey is also done by a collectivo that continues its journey to the villages around Lake Izabal. Collectivo’s usually cover distances within a city or to the surrounding villages. Most of the time, they don’t cover very large distances. But then again, in some rural area’s, they do, as there is not really another option of getting there. Collectivo’s are very cheap. They are the main method of transportation for locals and you pay the same price as they do. We have never been ripped off by using a collectivo before. To cross an entire city, the price is usually between 5 to 10 Quetzals. For collectivo’s within cities, people don’t usually carry tons of luggage. However, the occasional chicken or bag of potatoes is always an option. We used a collectivo to switch between hostels and at that time, we had all of our luggage with us. Our backpacks were with us inside of the collectivo as it didn’t have an appropriate rooftop to carry luggage. At a different occasion, where we traveled in between towns, there was a designated luggage area on the roof of the minibus. Depending on the place and vehicle, your luggage can go on the roof or inside the vehicle. Complete List of Epic Things to do in Antigua Guatemala to Rock your Trip! In Guatemala, Tuc Tuc’s mostly operate like short distance taxi’s. However, sometimes, they cover rather large distances and you’d be surprised about how fast they can go! Tuc Tuc’s are mostly used for transportation within a town or city. They’re basically scooters with a little more seating space. You must try a Tuc Tuc at least once when looking for traveling in Guatemala! To clarify: you can’t catch them and take them home! Tuc Tuc’s are strategically waiting outside markets, supermarkets, town squares and other crowded places. You can either catch a Tuc Tuc that is waiting somewhere. But you can also haul one in the street. If they’re available, they will stop for you. Lobke managed to catch a Tuc Tuc after all – We released it afterward! Tuc Tuc’s are mostly used for trips within a city or for short trips to neighboring villages. These mini-taxis don’t cover large distances most of the time. Tip: Agree on the price for a trip before you get in. Foreigners can get higher rates than locals in many occasions. Aha! That’s an awesome question! Your luggage goes anywhere it fits! And you might be surprised at how much luggage actually fits inside these vehicles. Our tuc tuc driver once fitted 4 people, with large backpacks and daypacks inside his tuc tuc. We weren’t very comfortable and it was an advantage that we were all good friends, but it worked! In cities like Guatemala City, Antigua, and Quetzaltenango, it is possible to catch an actual taxi. But for most area’s in Guatemala, Tuc Tuc’s are the taxi’s. As for the real taxi’s in the form of an actual car, you can find these for instance at the airport or for longer drives outside of town. The largest part of Guatemala is not yet covered by Uber. Only Guatemala City and Antigua have this option right now. Taxi’s are mostly found in Guatemala City, for instance, at the airport. You can catch one there. Another option is to have your hotel or hostel call a taxi for you. If you’re in Guatemala City or Antigua, get a driver with the Uber app. Taxi’s will cover almost any distance you want them to. Probably, they won’t take you on a 7-hour journey and they will rather take you to the bus terminal for that. But then again, anything is possible in Guatemala! Some taxi’s have a meter, but I recommend agreeing on the price before you get in the vehicle. Taxi are not extremely expensive, but as always, foreigners can get scammed by taxi drivers anywhere in the world. Some routes in Guatemala are not covered by public transportation. An example of this are the rural villages in the mountains around Lake Atitlan or other rural places. Locals also use pick up trucks to get around. They know where to wait for them and they know the price for the ride. If you wait with them and talk with them, you will also be able to catch a ride in this way. A second way to catch a ride like this is to stand beside the road and start hitchhiking. It might take a while before someone stops, but if you’re lucky, you get a ride pretty quick. Compare this method of transportation with hitchhiking. You can travel to where the driver is traveling. You agree on the price before getting into the vehicle. The best method is asking local travelers how much the ride is. They always pay the same price for the same route. If the driver then charges you double, you know you’re paying too much. You might as well be ok with paying more if there’s no other option for transportation available. Boats and lancha’s are a big deal! 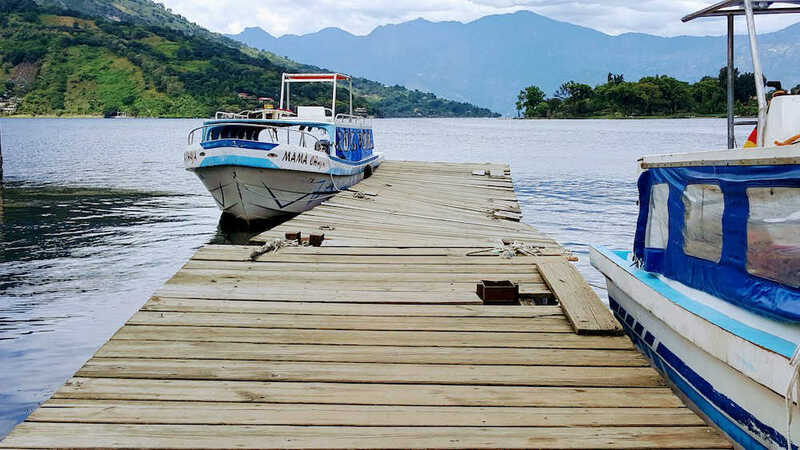 They might not be the first thing you thought about when thinking of transportation in Guatemala, but they are very important in destinations like Rio Dulce, Livingston, and of course: Lake Atitlan! Let’s see how they operate at Lake Atitlan! Boats and water taxi’s in Lake Atitlan are traveling around the lake all day. Every 15 minutes, at least one boats passed the shoreline at any location. At Lake Atitlan, you can catch these public boats easily and they will pick you up at any pier there is. Just stand on one of the piers that is closest to you. When a boat arrives in the distance, make sure you’re standing in a visible and prominent place so they can see you. You have to wave at them or they won’t stop! Loads of people are hanging out on different piers. The only thing you need to know before you go is whether you need to catch one traveling to the left or to the right. So you better have an idea of what the lake looks like on the map. You should also know which Atitlan village you want to visit! These water taxi’s are operated by 2 people. One is navigating, while the other helps passengers to board. You have to tell the helper what your destination is, so they can make a stop there! The water taxi’s at Lake Atitlan have a set route. There’s a route that travels from Panajachel to San Pedro: the most used tourist route. These boats stop along the way if people are hauling them. But they also stop in the villages. So for this specific route, the boat crosses the entire lake, staying in sight of the shore the whole time. If you’re going to the other side of the lake, you need to get a different boat from San Pedro or from Panajachel. We always agreed on the price before we got on the boat. Tourists and foreigners usually pay more for the same ride, unless you let them know that you are aware of the rate. The trip from Panajachel to San Pedro is 40 Q. To get from San Marcos to San Pedro, you pay 15 Q. There are 2 options for luggage. Large backpacks and luggage usually go on the roof of the boat or in the front tip. Sometimes, when it’s not busy, you can take your luggage with you. Transportation on the Rio Dulce works differently from the Atitlan water taxi’s. To get around on the Rio Dulce, we recommend taking caring of your transportation with your hostel or finca. Most of the river finca’s will pick you up for free in Rio Dulce Pueblo or Livingston if you stay at least 2 nights. Otherwise, they might charge you somewhere between 50 Q and 150 Q, depending on the distance. But it seems common that when tourists try to get transportation for the river, they get sent to a tourist office, which sells them overpriced tickets for completely packed trips on the river. There are public lancha’s on the river as well. The public lancha from Rio Dulce Pueblo to Livingston leaves twice a day: at 9h30 in the morning and at 14h in the afternoon. Talk to your hostel or river finca for the best deals. To catch the public river lancha, go to the public docks in Rio Dulce in time before the 2 possible departure times: 9h30 and 14h. Note that these times can change without notice. The public boat from Rio Dulce to Livingston costs 125 Q one way. If you return the same day, you can buy a return ticket for 200 Q. This website has useful information about transportation in and around Rio Dulce and Livingston. On the Rio Dulce, luggage usually just goes inside the boat with you. But it could also be stacked on the roof of the boat. Whenever you’re traveling in Guatemala, you should always keep in mind where you are. Unforeseen circumstances happen all the time. Even though transportation like shuttles is supposed to be quite punctual, it isn’t always possible to stay on schedule. More than once, we arrived many hours after the planned arrival time. And when I say: many hours, I really mean many, many hours! We once lost 2 or 3 hours because a tree had fallen onto the road near Lake Atitlan. Even though we lost a few hours, we didn’t really mind. It was super interesting to get an insight into how they deal with these kinds of issues in Guatemala. It took a long time and a lot of people to get the tree off the road. I actually enjoyed this small discomfort and I believe it belongs in a backpacking trip. If nothing like this happens, you won’t have much of a story afterward! On a few other occasions, we got stuck in traffic. All the cars just stopped because for some reason they closed the road for some time, due to different reasons. This is not exciting at all and you just have to wait until the cars start moving again. 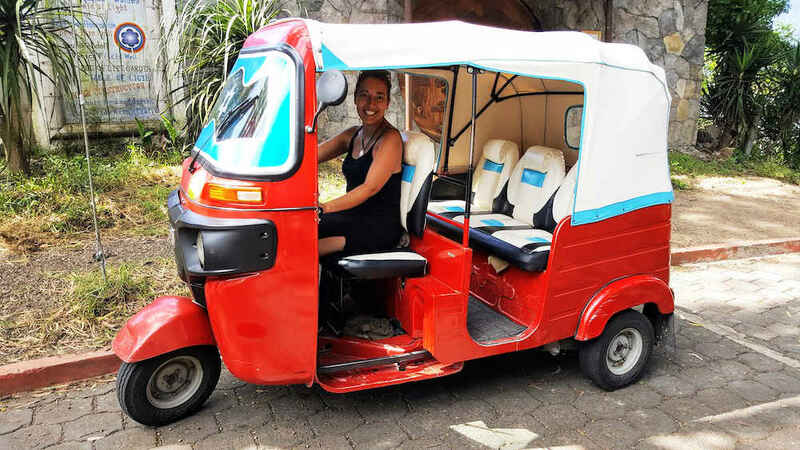 As you can read, there are loads of different options to get around in Guatemala! Select the one that suits your trip and budget. Some of the transportation methods are for specific reasons. In other places, you have multiple ways to do the same trip. But the most important thing to remember is: enjoy the travel! Once you start enjoying watching the scenery and observing local life, you will definitely enjoy your journey the most. If you know before you go that there can be delays, you learn to embrace the way of the road. Take you time and adapt to the local lifestyle! We tried to include all the travel styles and transportation options in this guide. If you encounter irregularities or have essential information to add to this guide, please let us know!